I first went to the Cavern with my friend Hilary Williams when we were 16 years of age. I remember walking down the cobbled street and into the narrow passageway at the entrance to the club, then descending down the steep steps. The smells was unique – a mixture of rotten fruit and disinfectant. Pure beat music, loud and pulsating, greeted my ears. I then saw four leather-clad figures rocking away on stage, predominantly doing cover versions of great artists such as Chuck Berry and Jerry Lee Lewis. Yes, this was my first glimpse of The Beatles. It was wonderful in there. In the interval, Bob Wooler (the resident Cavern DJ) would invariably play Pat Boone’s ‘speedy Gonzales’. We always left the club to Bobby Darin’s ‘I’ll be there,’ which I think Bob played to contrast with The Beatles’ rock ’n roll music. Typically favourite numbers of ours included George Harrison singing ‘Sheik of Araby’, Paul McCartney with ‘Besame Mucho’ and ‘Slow Down’, where John Lennon would take to the microphone. I still have my typed list of all the numbers they did. After most numbers, John would pretend to write on the palms of his hands and would say ‘thank you folks’. The other fans I remember were Louie, a girl with long black hair, who was known as the ‘number one fan of Paul McCartney;’ Ann Kaye and a pretty blonde girl called Marie, who went out with George Harrison. There was also Bernadette Farrall, who would grow up to run The Beatles Story at the Albert Dock with her with her husband Mike Byrne, who was with The Roadrunners. When their original drummer Pete Best was sacked, we went to his house at Hayman’s Green to see him. His mother, Mona, answered the door with Roag, her new born baby, and we went in and sat with Pete in silence. It was very sad. Little did we know at this point what huge fame and fortune he was going to miss out on! In the 1990s Pete went to visit my friend Hilary with his brother Roag, and I have photos of us all in Hilary’s front room. I lived in Calderstones Park, with Menlove Avenue (where John Lennon lived) running alongside it. I remember going to see Cynthia there to congratulate her on the birth of Julian. Hilary lived near Forthlin Road, and we went to see Jim McCartney, Paul’s father, who invited us all in. He was a lovely man. Hilary would iron Paul’s shirts. I remember Jim saying how well-spoken I was! I remember John sometimes winked at me as he went inside The Cavern. Of course, at the age of 16, I was quite overcome! 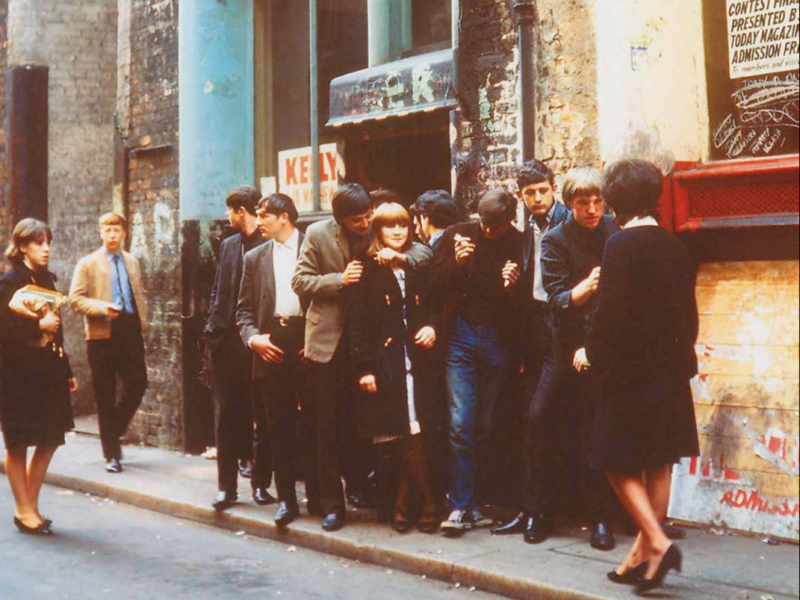 My parents would not allow me to queue overnight at The Cavern, as some of the other girls did when the band became more famous. Nevertheless, I went to most of the lunchtime sessions. On one occasion, I remember leaving my strict school in the lunch break to go there (we weren’t allowed to leave the premises). When I was found out I was severely reprimanded by the head mistress. My mother always said it was Paul McCartney’s fault that I failed my exams! I feel I was very privileged to have gone to The Cavern at such an exciting time, and treasure the memories greatly.